Dan Huss and Ms Dreamy tied for first place with Jordan Larson and HDC Gunnabeabigstar at the FEI CRI 3* WEG Test Event hosted at Tryon International Equestrian Center. The all-American podium stood tall after the completion of two days of FEI CRI 3* competition hosted at Tryon International Equestrian Center (TIEC), in Tryon, North Carolina, alongside the first installment of the Carolina Classic at TIEC. The week served as the eighth and final Test Event ahead of the FEI World Equestrian Games™ Tryon 2018 coming to the venue this fall, from September 11-23. FEI combinations took to the newly constructed Indoor Arena, located at the main entrance of TIEC, to test their skills against some of the discipline’s biggest names from Thursday, May 10-13. The first day of competition saw 22 competitors contest the USEF Selection Trial First Go on Thursday, May 10, before welcoming back 20 of the original entries. Ultimately, Jordan Larson (USA) and Dan Huss (USA) both walked away with the blue ribbon, tying on a composite score of 450. Huss entered the second round sitting in first place after scoring 224 points aboard Frederick Christen’s Ms Dreamy, a 2010 Quarter Horse mare (Magnum Chic Dream x A Gal With A Gun). Larson improved upon his first-round score of 222.0 to share top honors riding ARC Gunnabeabigstar, a 2011 Quarter Horse stallion (Gunnatrashya x Wimpys Little Chic) owned by HDC Quarter Horses, to an impressive second-round score of 228. The young Cade McCutcheon (USA) followed just behind on a total score of 446 points aboard Custom Made Gun, a 2011 Quarter Horse stallion (Colonels Smoking Gun x Custom Made Dunit) owned by McQuay Stables, after receiving a 222.5 in the first round and a 223.5 in the final competition. All three riders are hoping to return to represent the United States at the FEI World Equestrian Games™ (WEG) in September and Huss commented that he’s been waiting for the right horse to come along in order to pursue contention. 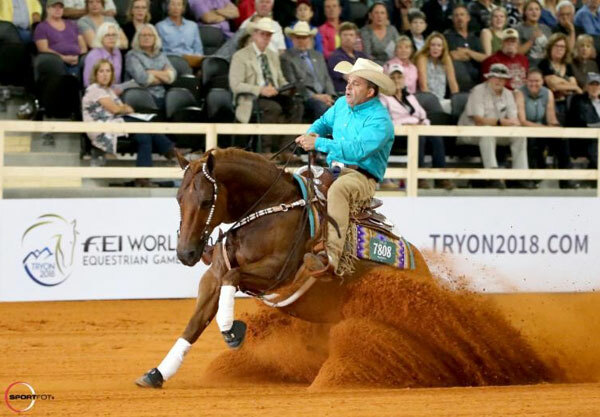 Cade McCutcheon, whose 18th birthday is in a few short weeks, is also looking for the chance to represent his country, with his sights set on being the youngest reining competitor to ever compete in the history of the WEG. Further discussing his family legacy, McCutcheon also noted the incredible accomplishments of his multi-generational equestrian family. Despite being the youngest rider in the FEI CRI 3* this week, McCutcheon commented on the benefit of the experience as he looks towards a bright future.